LAGRANGE, Ga. — A shad bite, a common fishing pattern, can take on many variations. One twist is the spawning shad bite, important this week for several of the Bassmaster Elite Series anglers competing on West Point Lake in the Pride of Georgia. David Walker found spawning shad Thursday morning, then continued to key in on shad throughout the first competition day. The strategy worked so well for him, he boated 21 pounds and 3 ounces for third place. Two of his five largemouth came on the spawn bite, which is happening (as far as humans can see) at daybreak. By the time the Elite anglers are getting to their first stops, the spawn is almost finished for the day, and an angler has to act fast. On Thursday, Walker said, “It was over quick” — done for him in less than an hour. The West Point Lake event is set up perfectly for the spawn bite. That’s because the days are getting longer, and “safe light” occurs early enough that Bassmaster officials were able to schedule a 6:45 a.m. start time. A later takeoff would miss the shad activity, and the fact that the event happened during the shad spawn at all would be a moot point. 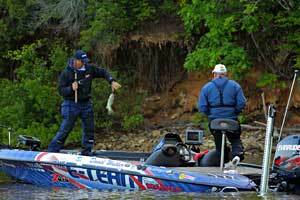 A spawning shad bite, if you can find it, is important because it kick-starts a competition day, said Walker. It’s a confidence boost that can be pivotal to a day’s success, he said. Nate Wellman, in 14th place after Thursday, found spawning shad, but discovered that landing the bass chasing them was another matter. Ben Parker, 16-4 for 10th place, said he also tried to get a bite on the shad spawn, but wasn’t able to. Others reported moderate success, or credited their first fish to the pattern. Elite pro Mark Menendez described it as a surface disturbance that looks as if someone was holding a showerhead over the water and turning the tap on and off. Menendez, who has a degree in fisheries biology, provided more details of a shad spawn — threadfin shad in particular. The eggs are so small, they are not visible to the naked eye, he said. Although they’re in schools for protection, the shad have other things on their minds than avoiding predators, and bass know it. The spawning shad pattern — a subpattern, really — isn’t a must-have on West Point. First-day leader Edwin Evers said he looked for it, but didn’t find it. Still, he collected 22 pounds, 4 ounces, on a grab bag of other patterns.